Cambridge Connection – Computer Studies, is an eight-level series, synchronised with new ICSE guidelines. 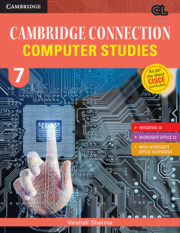 Cambridge Connection – Computer Studies, is a compelling eight-level series of textbooks, comprehensively designed to empower students in the competent use of technology in and outside the school. The textbooks, align practical knowledge of students with everyday experiences and deliver the curriculum through age-specific, task-based and engagingly rich pedagogic design. Synchronised with the new ICSE guidelines and based on Windows 10 and Microsoft Office 2013 with updates on Microsoft Office 2016, Cambridge Connection – Computer Studies for ICSE Schools is a rounded series redefining computer education in classrooms with its empirical methodology and emphasis on inter-disciplinary approach. Connect and Learn bridge students’ prior knowledge and new information. Task brings in real-life experiences to understand the nature and use of technology. Activity provides age-appropriate and hands-on activities to explore, practise, discuss and self-assess and make learning more meaningful. Tech Help, Look Up and Glossary provide language and content-based support and enrichment to teachers and students. Evaluate, Brainstorm, Apply and Extend cater to Higher Order Thinking Skills (HOTS) and an attitude of inquiry. Play and Learn (Grades 1, 2 & 3) and Coding Club (Grade 4 onwards) provide opportunities for extended learning. 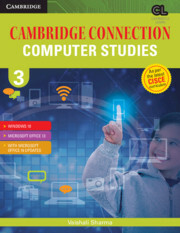 Famous IT Personalities familiarizes the young learners with famous IT figures and their contributions. Checklists and Assessments aid self-evaluation for learners and formative assessments for teachers.